Turning the beat around, or Rhythmic Displacement is an excellent way to spice up your rhythm guitar playing. 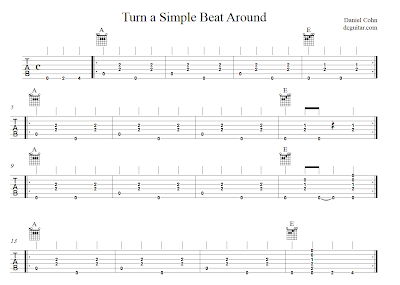 Here is a simple illustration of what it is, and how you can practice turning a simple beat around. This example is a basic country two-beat. In the pickup bar, we have the typical 'bomp bomp bomp' country music pickup notes. They are a means of signifying the end of a musical phrase, or the beginning of the next musical phrase. You can also signify the end of a phrase with more funk by using rhythmic displacement. The first full line is a four bar phrase. Three bars of A, followed by one of E. The rhythm played in the bass is identical in every bar. As you play it, simply notice how the change to an E chord punctuates the end of the four bar phrase. Now we aren't only using harmony to punctuate the phrase, we are using rhythm. Funky! Now go on and get funky!